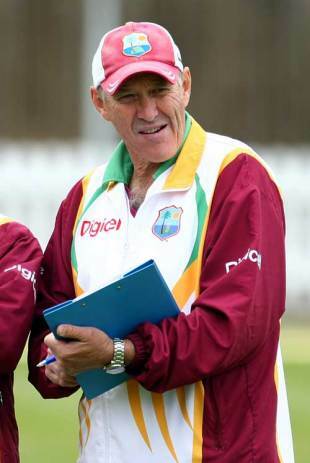 West Indies coach John Dyson has said that despite his team losing the Test Series against Bangladesh, he expects competitive performances in the three-match ODI series. "This is a totally different game now," Dyson said. "We're playing 50-over cricket, not five-day cricket. The two Test matches were closely fought, it wasn't a case where we were thrashed in either of the matches. We could have won both so I don't think there's much in it." Though the Test squad was made up of replacement players - following strike action by the more reputed names - Dyson said he was not disappointed with the way they performed. "For guys who had little experience in international cricket to come forward like that and play as well as they did, I think they did pretty well," Dyson said. "They've played some good cricket so far, unfortunately we weren't able to get across the line and win the Tests." The first two ODIs will be played in Dominica on Sunday and Tuesday, and Dyson hoped the pitches would nullify the Bangladesh spinners and aid the West Indian pacemen. "I'm looking forward to the one-dayers. What I'd like to see is a hard, pacy, bouncy wicket," Dyson said. Given the statistics from the two Test matches in St Vincent and Grenada, the Bangladeshi spinners - led by captain Shakib Al Hasan - have been dominant. They took 33 of the 40 wickets with Shakib and Mahmudullah, both picking five-wicket hauls. The duo along, with Enamul Haque jnr, who featured in the second Test, worked over the West Indies batsmen with relative ease. Contrastingly, fast bowlers Kemar Roach and Darren Sammy were the standout performers for the hosts. Roach, who debuted in the first Test, was the highest wicket-taker for West Indies with 13. He bowled with disconcerting pace and bagged an impressive career best 6 for 48 in the first innings in Grenada. Sammy also had impressive returns by picking up back-to-back five wicket hauls. In the first match, Sammy took 5 for 70 in the Bangladesh second innings, and followed it up with identical figures in Grenada. It is no surprise, therefore, that Dyson is keen on a pitch which will offer some assistance to the pacers with the West Indies squad comprising Roach, Sammy, David Bernard, Nelon Pascal and Gavin Tonge.